This luxury farm conversion dates back to the 1400sand is packed full of period features. Steeped in history and natural character, Elvey Farm is a little-known gem. Located just 6 miles from Ashford town centre. Elvey Farm is where the idyll of rustic living mingle with boutique magic. Enclosed in 75 acres of beautiful farmland on the fringes of the Kent Downs National Park, this stunning Ashford property provides a dreamy country retreat. 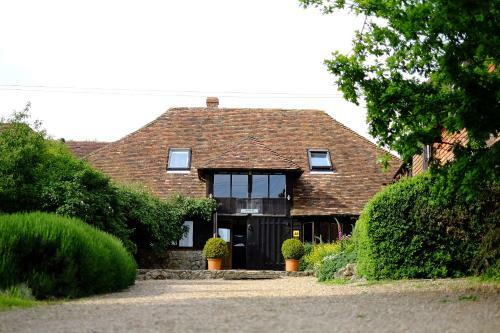 Located just off the M20 by Dering Wood, this is no ordinary farmhouse. Guests at the hotel can look forward to top-quality accommodation, with 9 beautifully appointed rooms. Suites in the Stable Block have their own private entrances and living rooms and all rooms are en suite. Guests can idle away the day exploring the bridleways and walks around the farm, or enjoy a spot of lunch in one of the many village pubs. The Dining Room restaurant features freshly prepared foodstuffs, sourced from local suppliers including fish from Griggs of Hythe and meat from T L Coopers in Ashford.